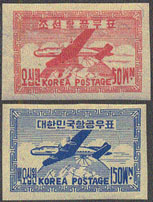 443 ND SOUTH KOREA (1947) Plane*. Set of 2 imperforates. Scott Nos C1-2, Yvert Nos PA1-2.